Lupus (LOO-puhss) is a chronic, autoimmune (aw-toh-ih-MYOON) disease. It can damage any part of the body (skin, joints, and/or organs inside the body). Chronic means that the signs and symptoms tend to last longer than six weeks and often for many years. In lupus, something goes wrong with your immune system, which is the part of the body that fights off viruses, bacteria, and other germs (“foreign invaders,” like the flu). Normally your immune system produces proteins called antibodies that protect the body from these invaders. Autoimmune means your immune system cannot tell the difference between these invaders and your body’s healthy tissues (“auto” means “self”). In lupus, your immune system creates autoantibodies (AW-toh-AN-teye-bah-deez), which sometimes attack and destroy healthy tissue. These autoantibodies contribute to inflammation, pain, and damage in various parts of the body. When people talk about “lupus,” they usually mean systemic lupus erythematosus (ur-uh-thee-muh-TOH-suhss), or SLE. This is the most common type of lupus. It is hard to guess how many people in the U.S. have lupus, because the symptoms are so different for every person. Sometimes is not diagnosed. The Lupus Foundation of America thinks that about 16,000 new cases are reported across the country each year. Although lupus can affect almost any organ system, the disease, for most people, affects only a few parts of the body. For example, one person with lupus may have swollen knees and fever. Another person may be tired all the time or have kidney trouble. Someone else may have rashes. Over time, more symptoms can develop. Normally, lupus develops slowly, with symptoms that come and go. Women who get lupus most often have symptoms and are diagnosed between the ages of 15 and 45. But the disease also can happen in childhood or later in life. For some people, lupus is a mild disease. But for others, it may cause severe problems. Even if your lupus symptoms are mild, it is a serious disease that needs constant monitoring and treatment. It can harm your organs and put your life at risk if untreated. Systemic lupus erythematosus, or SLE, makes up about 70 percent of all cases of lupus. SLE can be mild or severe and can affect various parts of the body. Common symptoms include fatigue, hair loss, sensitivity to the sun (photosensitivity), painful and swollen joints, unexplained fever, skin rashes, and kidney problems. In general the diagnosis of lupus is based off of a combination of physical symptoms and laboratory results. Discoid (DISS-koid) lupus erythematosus, also called DLE, mainly affects the skin. The discoid rash usually begins as a red raised rash that becomes scaly or changes color to a dark brown. These rashes often appear on the skin on the face and scalp, but other areas may also be affected. Many people with DLE have scarring. Sometimes DLE causes sores in the mouth or nose. A doctor will remove a small piece of the rash or sore and look at it under a microscope to tell if someone has DLE. If you have DLE, there is a small chance that you will later get SLE. Currently there is no way to know if someone with DLE will get SLE. Subacute cutaneous lupus erythematosus makes up 10 percent of lupus cases. About 50 percent of the time, people with subacute cutaneous lupus also have SLE. Subacute cutaneous lupus causes skin lesions that appear on parts of the body exposed to sun. These lesions do not cause scars. Drug-induced lupus is a form of lupus caused by certain medicines. The symptoms of drug-induced lupus are like those of systemic lupus, but only rarely affect major organs. Symptoms can include joint pain, muscle pain, and fever, and are mild for most people. Most of the time, the disease goes away when the medicine is stopped. However, not everyone who takes these drugs will get drug-induced lupus. The drugs most commonly connected with drug-induced lupus are used to treat other chronic conditions, such as seizures, high blood pressure, or rheumatoid arthritis. Examples include procainamide (Pronestyl®, Procanbid®); hydralazine (Apresoline®; also, hydralazine is an ingredient in Apresazide® and BiDil®); phenytoin (Dilantin®); etanercept (Enbrel®); and adalimumab (Humira®). Neonatal lupus is a rare condition in infants that is caused by certain antibodies from the mother. These antibodies can be found in mothers who have lupus. But it is also possible for an infant to have neonatal lupus even though the mother is healthy. However, in these cases the mother will often develop symptoms of lupus later in life. At birth, an infant with neonatal lupus may have a skin rash, liver problems, or low blood cell counts, but these symptoms disappear completely after several months and have no lasting effects. Infants with neonatal lupus can also have a rare but serious heart defect. With proper testing, physicians can now identify most at-risk mothers, and the infant can be treated at or before birth. Most infants of mothers with lupus are healthy. Apart from genetic factors, lupus can be more severe for people who aren’t getting the care they need. Studies have shown that people with lupus who have a lower household income, lower level of education, or less of a support system tend to do worse with the disease. For some people with lupus, severe symptoms of the disease leave them unable to work, which may result in low income and lack of health insurance. These factors make it hard for a person with lupus to get the right treatment — or sometimes even diagnosis — that they need. Why is lupus a concern for women? Heart disease. When you have lupus you are at bigger risk of the main type of heart disease, called coronary artery disease (CAD). This is partly because people with lupus have more CAD risk factors, which may include high blood pressure, high cholesterol, and type 2 diabetes. The inflammation that accompanies lupus also increases the risk of developing CAD. Women with lupus are often less active because of fatigue, joint problems, and/or muscle pain, and this also puts them at risk. Heart disease is the number one killer of all women. But, women with lupus are 50 times more likely to have chest pain or a heart attack than other women of the same age. Osteoporosis (OSS-tee-oh-puh-ROH-suhss). Women with lupus have more bone loss and broken bones than other women. This might be because some medicines used to treat lupus cause bone loss. The disease itself can also cause bone loss. Also, pain and fatigue can keep women with lupus from exercising. Staying active is important for keeping bones healthy and strong. Kidney disease. Many symptoms of lupus come from the swelling of organs in the body. Almost half of all people with lupus develop kidney problems, called lupus nephritis. Kidney problems often begin within the first five years after lupus symptoms start to appear. This is one of the more serious complications of lupus, but there are treatments if problems are caught early. However, it is important to know that kidney inflammation is not painful and you can’t feel it. That is why it’s important for people with lupus to keep up-to-date with the screenings their doctors recommend. These will include urine and blood tests. Genes play an important role, but are not the only reason a person will get lupus. Even someone who has one or more of the genes associated with lupus has a small chance of actually getting the disease. And only 10 percent of people with lupus have a parent or sibling who also has it. How can my doctor tell if I have lupus? Medical history. Telling your doctor about your symptoms and other problems can help her understand your situation. 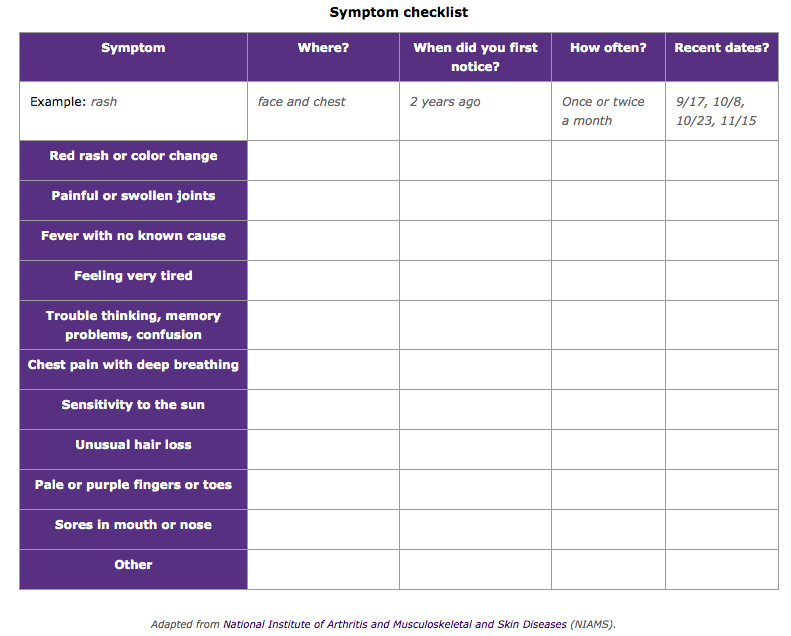 Keep track of your symptoms by writing them down. Family history of lupus or other autoimmune diseases. Tell your doctor if lupus or other autoimmune diseases run in your family. Blood and urine tests. The antinuclear antibody (ANA) test can show if your immune system is more likely to make the autoantibodies of lupus. Most people with lupus test positive for ANA. But, a positive ANA does not mean you have lupus. About five to ten percent of healthy women test positive for ANA. Skin or kidney biopsy (BEYE-op-see). With a biopsy, doctors perform a minor surgery to remove a sample of tissue. The tissue is then viewed under a microscope. Skin and kidney tissue looked at in this way can show signs of an autoimmune disease. Together, this information can provide clues to your disease. It also can help your doctor rule out other diseases that can be confused with lupus. Print out this table (PDF, 104 KB) and use it to make notes to take to your doctor. Put a check mark beside the symptoms you have. Note when you have them. Be careful with supplements. Never take vitamins or herbal supplements without talking to your doctor first. They might not mix well with medicines you use to treat lupus. Nonsteroidal anti-inflammatory drugs (NSAIDs). NSAIDs are used to reduce pain and swelling in joints and muscles. They can help with mild lupus when pain isn’t too bad and vital organs are not affected. Aspirin, ibuprofen, and naproxen are some over-the-counter NSAIDs. You need a prescription for stronger ones. NSAIDs can cause stomach upset, heartburn, drowsiness, headache, fluid retention, and other side effects. If overused, NSAIDs also can cause problems in your gastrointestinal tract (which includes the stomach), blood, liver, and kidneys. In pregnant women, NSAIDs should be avoided after the first trimester. They should be used with caution in women who breastfeed. Antimalarial drugs. Medicines used to prevent or treat malaria are used to treat joint pain, skin rashes, fatigue, and inflammation of the lungs. Two common antimalarials are hydroxychloroquine sulfate (Plaquenil®) and chloroquine phosphate (Aralen® phosphate). Side effects of antimalarials can include stomach upset, nausea, vomiting, diarrhea, headache, dizziness, blurred vision, trouble sleeping, and itching. People treated with antimalarials should see an eye doctor every year, because of the low risk of eye problems. Studies have found that taking antimalarials can stop flares and some help people with lupus live longer. BLyS-specific inhibitors. The first medication approved by the Food and Drug Administration under this new class of drugs is called belimumab (Benlysta®). It limits the amount of autoantibodies found in people with lupus. The drug blocks the action of a specific protein in the body that is important in immune response. Two clinical studies in more than 1,600 people with lupus showed Benlysta to be safe and effective. However, the research did not have enough data showing Benlysta to be effective in African-Americans, so another study is being done. In clinical studies, people taking Benlysta reported more deaths and serious infections than those not taking the drug. Benlysta should not be given with live vaccines. The most common side effects included nausea, diarrhea, and fever. Immunosuppressive agents/chemotherapy. These agents are used in severe cases of lupus, when major organs are affected by lupus and other treatments do not work. These drugs suppress the immune system to limit the damage to the organ. Examples are azathioprine (Imuran®), and cyclophosphamide (Cytoxan®), mycophenolate mofetil (Cellcept), and methotrexate (Rheumatrex® and Trexall®). These drugs can cause serious side effects including nausea, vomiting, hair loss, bladder problems, decreased fertility, and a risk of cancer and infection. These drugs can also cause birth defects. If you take these medicines, your doctor may tell you to avoid pregnancy. You and your doctor should review your treatment plan often to be sure it is working. Also, you may need other drugs to treat conditions that are linked to your lupus — such as high blood pressure, osteoporosis, or blood clots. Many people with lupus are prescribed anticoagulants (“blood thinners”), such as warfarin (Coumadin®) or heparin, because of the risk of blood clots. An untreated blood clot can cause a stroke or heart attack. Pregnant women should not take warfarin. Tell your doctor about any side effects or if your medicines no longer help your symptoms. Tell your doctor if you have new symptoms. Never stop or change treatments without talking to your doctor first. Are there options for treating my lupus with complementary or alternative medicine? Some people with lupus try creams, ointments, fish oil, supplements, special diets, or homeopathy, or see a chiropractor, to care for their lupus. Some people with lupus have said these help. However, research has not proven that any of these alternatives successfully treats lupus or reduces the risk of other problems. More importantly, research has not been done to show whether these therapies could be harmful. That is why you must talk to your doctor before trying any alternative remedy. Don’t stop or change your prescribed treatment without first talking to your doctor. Should I get vaccines if I have lupus? Vaccines that protect against pneumonia and the flu are safe for people with lupus if they are killed virus vaccines. (These vaccines have no active virus and can’t make you sick, but they can still help you make antibodies.) Your doctor may suggest that you get these vaccines to lower your risk of infection. However, they may not work as well for you as for other people who don’t have lupus, especially if you are taking steroids or other immunosuppressive drugs. It is possible that vaccines that contain live virus — like the vaccines for measles, mumps, and rubella, and sometimes flu — may be dangerous for some people with lupus. However, people with lupus have reported receiving these shots with no problems. Ask your doctor what is best for you. Will I need to see a special doctor for my lupus? Depending on your symptoms and/or if your organs have been hurt by your lupus, you may need to see special kinds of doctors. Start by seeing your family doctor and a rheumatologist (ROOM-uh-TOL-uh-jist), a doctor who specializes in the diseases of joints and muscles such as lupus. What can I do to control my lupus symptoms and prevent flares? Contact your doctor right away if you suspect a flare is coming. Should I change my diet because I have lupus? People with lupus may have to make changes to their diet based on their symptoms, on treatment, and other factors. Ask your doctor if you should eat a special diet because of your lupus. For instance, people with lupus are more likely to get hyperlipidemia (HEYE-pur-lip-ih-DEE-mee-uh) (high level of fats in the blood). With this condition, you will need to follow a low-fat diet. If your lupus is causing many high fevers, you may need to eat more calories. Or, steroids and other drugs might cause you to gain weight, and you will need to switch to a low-calorie diet. Because people with lupus need to avoid the sun, they may lack vitamin D. Your doctor may tell you to take a vitamin for this reason. Herbal supplements have no proven benefit and can cause harm. Talk to your doctor before trying any vitamins or herbal supplements. Living with lupus can be hard. How can I cope? Pace yourself. People with lupus have less energy and must manage it wisely. Most women with lupus feel much better when they get enough rest and avoid taking on too much at home and at work. To do this, pay attention to your body. Slow down or stop before you’re too tired. Learn to pace yourself. Spread out your work and other activities. Reduce stress. Exercising with your doctor’s okay, finding ways to relax, and staying involved in social activities you enjoy will reduce stress and help you to cope. Get support. Be open about your feelings and needs with family members and friends. Consider support groups or counseling. They can help you to see that you are not alone. Group members teach one another how to enjoy life with lupus. Talk to your doctor. The symptoms of lupus and some medications can bring on feelings of depression. People with lupus are more likely than others to be depressed and anxious. It is important to tell your doctor about your feelings, so that if it’s needed, he or she can treat you for mental health disorders that are more common in people with lupus. Learn about lupus. People who are well-informed and involved in their own care have less pain, are more active, make fewer visits to the doctor, and feel better about themselves. I have lupus. Is it safe for me to become pregnant? Your disease should be under control or in remission for six months before you get pregnant. Getting pregnant when your lupus is active could result in miscarriage, stillbirth, or other serious problems. Planning ahead is critical if you have lupus. Some women do get flares during pregnancy. The flares happen most often in the first or second trimester or in the first few months after you have the baby. Most flares are mild and easily treated. Preeclampsia (pree-ee-KLAMP-see-uh), or “toxemia,” is a serious condition that must be treated right away. Preeclampsia is a condition starting after 20 weeks of pregnancy that causes high blood pressure and problems with the kidneys and other organs. About 2 in 10 pregnant women with lupus get preeclampsia, though some studies say that rate is higher. The risk of preeclampsia is also higher in women with lupus who have a history of kidney disease. If you get preeclampsia, you might notice sudden weight gain, swelling of the hands and face, blurred vision, dizziness, or stomach pain. You might have to deliver your infant early. Pregnant women with lupus, especially those taking corticosteroids, are more likely to have high blood pressure and diabetes, and to have kidney problems. Regular doctor visits and good nutrition during pregnancy are important to prevent these problems. There are certain groups of women with lupus for whom pregnancy is very risky for the mother and the fetus. This may include women who have a very high pulmonary hypertension, lung disease, heart failure, chronic kidney failure, kidney disease, or a history of preeclampsia. It also may include women who have had a stroke or a lupus flare occur within the past 6 months. Although many women with lupus have normal pregnancies, all lupus pregnancies should be considered “high risk.” This means there are certain factors that make problems during pregnancy more likely for women with lupus. It doesn’t mean there will be problems. Find an obstetrician (OB) who manages high-risk pregnancies and who can work closely with your regular doctor. Plan to have your baby at a hospital that can manage high-risk patients and provide the special care you and your baby may need. See your doctor often while you are pregnant. Talk to your doctor about which medicines are safe to use while pregnant. Make a plan for help at home during your pregnancy and after your baby is born. Motherhood can be very tiring, and even more so for women with lupus. Develop a birth control plan for after you have your baby. A pregnancy that occurs soon after giving birth has more risks even in women who don’t have lupus. It is possible to get pregnant before your period begins again or while you are breastfeeding. For more information, visit womenshealth.gov Getting Pregnant Again. I am pregnant. How can I tell whether changes in my body are normal or signs of a flare? Skin. While pregnant, you may have red palms and a rash. Lupus can also cause a rash. Joints. Pregnancy can cause aching in your joints. Lupus can also cause pain and swelling in your joints. Lungs. Pregnancy also can cause shortness of breath. Lupus can also make it hard to take deep breaths. Leg swelling. Pregnancy can cause your legs to swell. Swollen legs are also a sign of kidney problems in people with lupus. Fortunately, recent studies show that flares are uncommon and tend to be mild during pregnancy. Some women with lupus find their symptoms improve during pregnancy. Still, it’s important to report new symptoms to your doctor. This way, flares that do occur can be prevented or controlled. I am pregnant and have lupus. Will my baby be born healthy? Babies born to women with lupus have no greater chance of birth defects or mental retardation than babies born to women without lupus. About one to two percent of babies born to mothers who have the antibodies for lupus will have neonatal lupus that includes congenital heart block, a serious heart defect. In most cases, neonatal lupus goes away after 3 to 6 months and does not come back. A mother who does not have lupus can still give birth to a baby with neonatal lupus. It is common for these mothers to have symptoms of lupus or Sjogren’s syndrome (another autoimmune disease) later in life. Breastfeeding is possible for mothers with lupus. Some medicines can pass through your breast milk to your infant. Talk to your doctor about whether breastfeeding is safe with the medicines you use to control your lupus. Breastfeeding also can be very tiring because breastfed babies eat more often than formula-fed babies and your body needs energy to make milk. If the demands of breastfeeding become too much for you, think about breastfeeding only some of the time. Pumping breast milk to be used later also might help. You can also look into human milk banks. Never use milk you get directly from another woman or the Internet. You can find a human milk bank through the Human Milk Banking Association of North America. Talk to your doctor — you will need a prescription to get milk from a milk bank. My child has lupus — is it different for him or her? Lupus is the same disease in children that it is in adults. However, kids with lupus often have the disease for a longer period of time before it is diagnosed. Therefore, kids may have more problems at a younger age. They may need more aggressive treatment. Parenting a child with lupus has many challenges. You need to make sure your child takes medications as directed by his or her doctor. You will need to teach your child how to prevent flares. And you will need to make tough choices about balancing your child’s health against his or her desire to do the things other kids are doing. What research is being done on lupus? Clinical trials are medical research studies to see whether new treatments are safe and effective. These studies help doctors learn how people respond to medicines and other new or improved treatments. Patients and families can get information about these lupus trials at http://www.clinicaltrials.gov.